Executive Function: Development Across the Life Span presents perspectives from leading researchers and theorists on the development of executive function from infancy to late adulthood and the factors that shape its growth and decline. Executive function is the set of higher-order cognitive processes involved in regulating attention, thoughts, and actions. Relative to other cognitive domains, its development is slow and decline begins early in late adulthood. As such, it is particularly sensitive to variations in environments and experiences, and there is growing evidence that it is susceptible to intervention – important because of its link to a wide range of important life outcomes. The volume is made up of four sections. 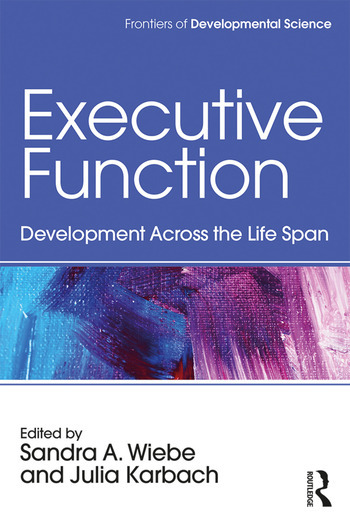 It begins with an overview of executive function’s typical development across the lifespan, providing a foundation for the remainder of the volume. The second section presents insights into mechanisms of executive function, as provided by a variety of methodological approaches. The third and fourth sections review the current research evidence on specific factors that shape executive function’s development, focusing on normative (e.g., bilingualism, physical activity, cognitive training) and clinically relevant (e.g., substance use, neurodegenerative disease) developmental pathways. Sandra A. Wiebe is a developmental cognitive scientist who studies executive function in childhood. She is an Associate Professor in the Department of Psychology and the Neuroscience and Mental Health Institute at the University of Alberta, Canada. Julia Karbach is a developmental psychologist who studies neurocognitive development and plasticity across the life span. She is a Professor at the Department of Psychology at the University of Koblenz-Landau, Germany.